These words from John Denver’s song, I’m Leaving On a Jetplane, still bring tears to my eyes. As a sixteen year old I imagined how dreadful it must have been for the girl to have her boyfriend leave so suddenly. How much it must have changed her life. Since then I have realized how our lives change all the time. Sometimes in dramatic and unexpected ways; at other times slowly but inexorably. Sometime we choose change: graduate from university; gap year in Europe; marriage; accept a new job with a better salary package; change careers; choose to take a retirement package ….. Sometimes, like the woman in the song, change is thrust upon us: a partner leaves; a mysterious illness changes our lives; we’re retrenched; we have a new manager; our major funders pull out of the business …. Although change can evoke strong emotions, it often is not the change itself which is difficult. It is the transition – the internal psychological process we undergo as a consequence of the change – that is the most tricky. What is ending in your life, and how would you like to prepare for it so that the new beginning is not marred by old patterns? 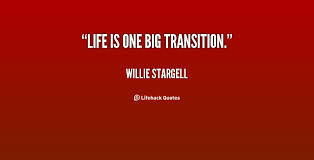 If you would like a process which will help you to navigate a transitional phase in your life contact me, Juliette Gyure (change management and transition coach), on joostejul@gmail.com, visit the home page of www.farsightcoaching.com or fill in the contact form. I look forward to hearing from you. This entry was posted in Business Coaching, Career Coaching, Leadership, Life Coaching and tagged transition; endings; new beginnings; stuck; life; business. Bookmark the permalink. ← The ending phase of transition: It is time to let go of…. Pingback: Can You Knit? Meaning and Purpose in Later Life! Contact Juliette Gyure: juliettegyure@gmail.com | +27 (0)72 635 3818 | Based in Durban | Skype coaching also available.